Rainy days and climate change. What’s happened to the weather? Not just in Ireland, but all over the world, this year has broken records everywhere. The wettest Summer in the UK since 1860. Same in Ireland. In USA there has been record high temperatures resulting in serious problems for agriculture. The end result will of course be food shortages and higher prices for available supplies. 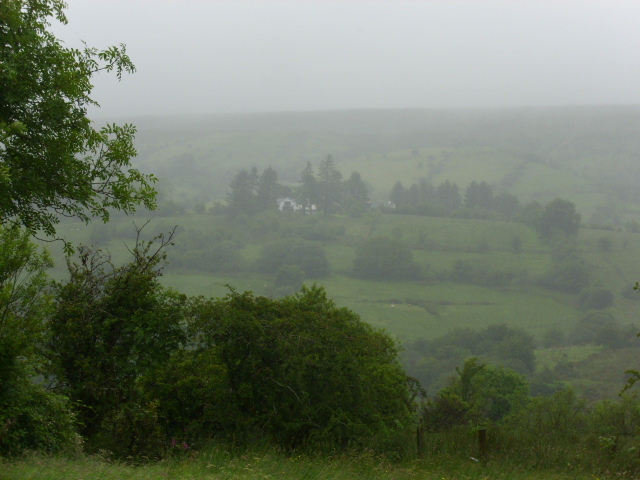 Today, 17th July, is a wet mizzly day here in Arigna. It should be Summer!! There’s definitely a change in the climate worldwide. The Irish Summer now seems to be March, April and May. Wet and dull through until September when we get another blast of good weather. I was reading earlier how the wet Summer has disrupted the cafe culture in Paris. Can’t blame people for not wanting to sit out in the rain sipping coffee. This then has a knock on effect on businesses and livelihoods. Here in Ireland agriculture is in serious trouble. Farmers can’t make hay or silage and the grass is starting to rot in the fields. Potatoes will be expensive this year as the crops have started to rot in the earth. A bit of a doomsday scenario but that’s how it is. How anyone can deny climate change now is beyond me. I’m amazed that flowers are blooming despite the lack of sunshine. Sunday was a fab day but that’s been the only good day for weeks. 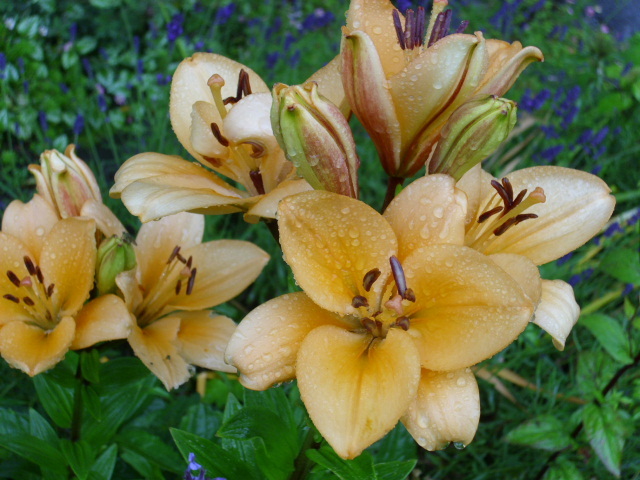 These Lilies were in bloom today but they won’t last long if the rain continues. 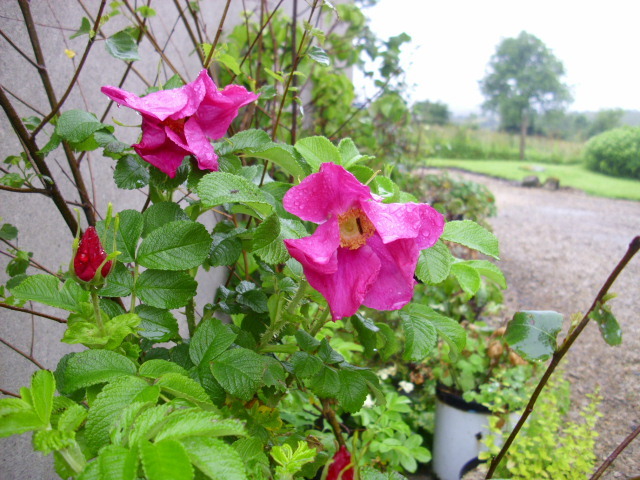 Rosa Ragusa looking similarly droopy. Of course there’s few insects to be seen. I was to be involved in the Butterfly count this year but there’s been few opportunities. What happened to all the Bumble Bees and Butterflies there were about in May I wonder? 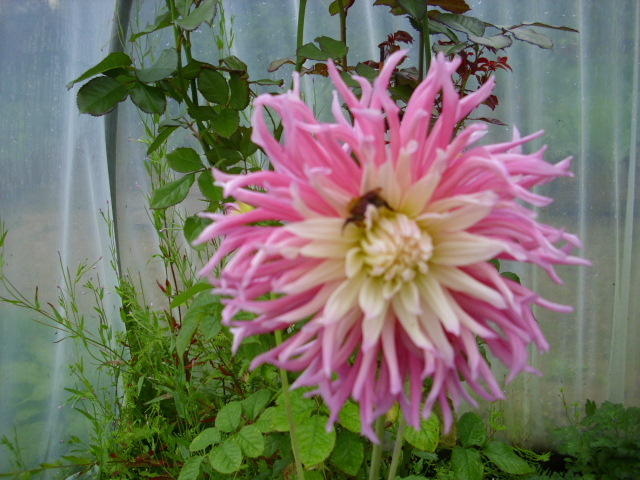 In the micro climate of the polytunnel a solitary Bumble Bee enjoys a newly emerged Dahlia. Glad I planted these in pots indoors as I don’t think they would have done any good outside. 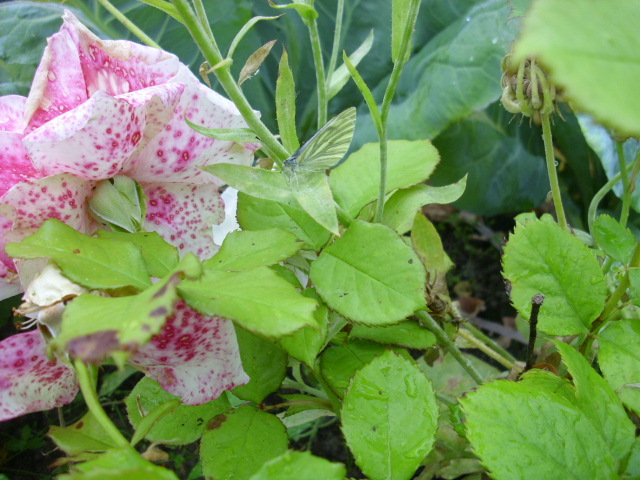 I also spotted a Green Veined White Butterfly on a Rose. Can you see it? There were a few more of these Butterflies about but that was all the insect activity I could see today. 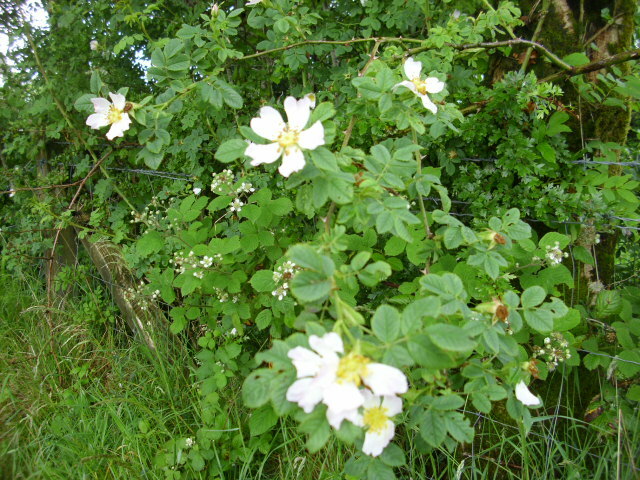 Mid July, the air should be filled with the sound of buzzing insects! So sad! On a more positive note the Peaches are almost ripe, in the polytunnel of course. I test them by cupping the fruit in my hand and gently pulling. If ripe the fruit will come away. 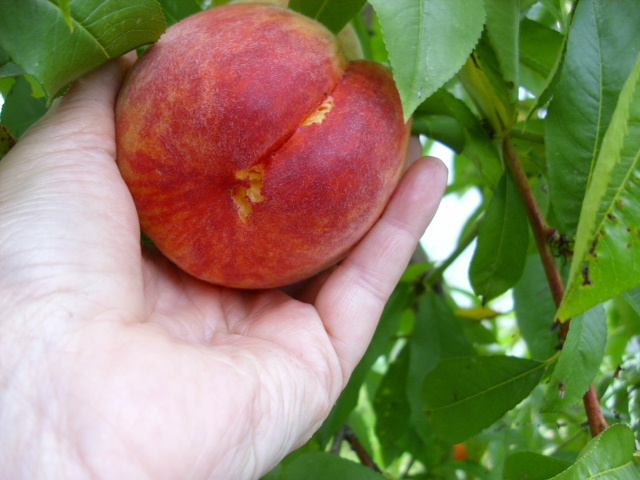 Another way to test for ripeness is to see if the flesh around the stem is soft. Test carefully though as Peaches bruise so easily. Another day or two to wait for this one. After having had pretty good weather in March, April and May it seems that June was the wettest since 1860. I do think that the south of the country had it worse though. Every time I rang my Mother it seemed to be raining heavily there, yes, we have had rain too, but it’s only the last 2 weeks that have been monsoon like. That’s climate change I suppose, some places getting less rain while we get more. If it continues in this vein more growing will have to be done indoors in polytunnels, in Ireland anyway. The overcast skies are quiet depressing and heavy. 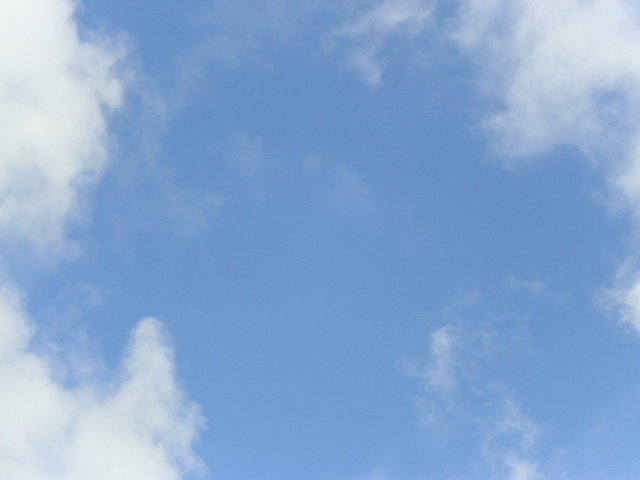 A rare patch of blue sky yesterday evening had me rushing out with the camera to capture it! 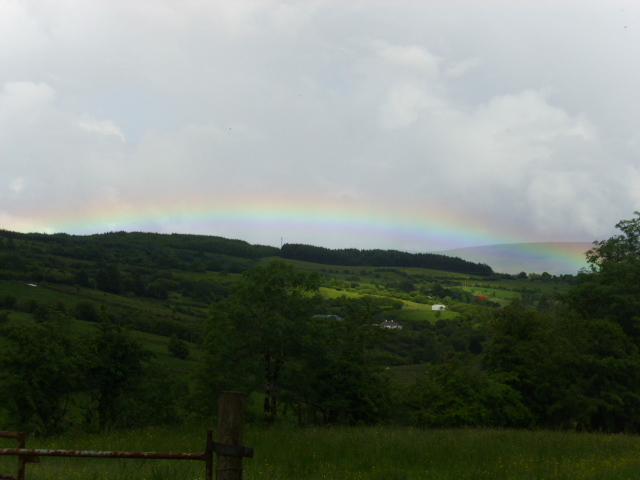 It darkened again almost immmediately and this rainbow which bridged Corry and Sliabh an Iariann appeared. Not the usual high arch to this one. Very squat and low lying. Have’nt seen one this low before. Even the rainbows are affected by the low cloud!! 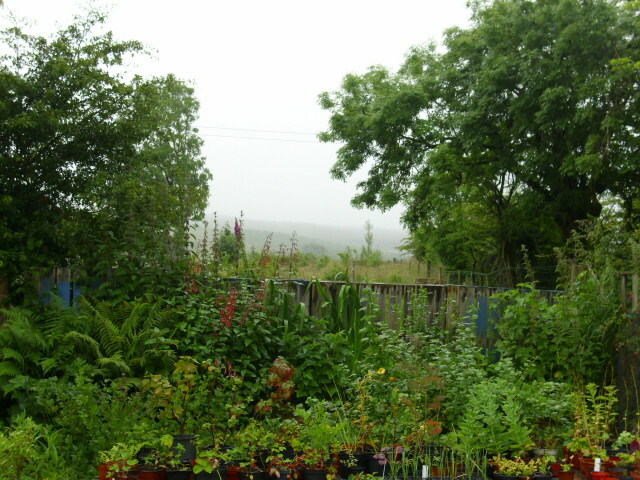 Does’nt the countryside look beautifully fresh and lush though…one benefit of all that rain. In the garden flowers are doing surprisingly well. 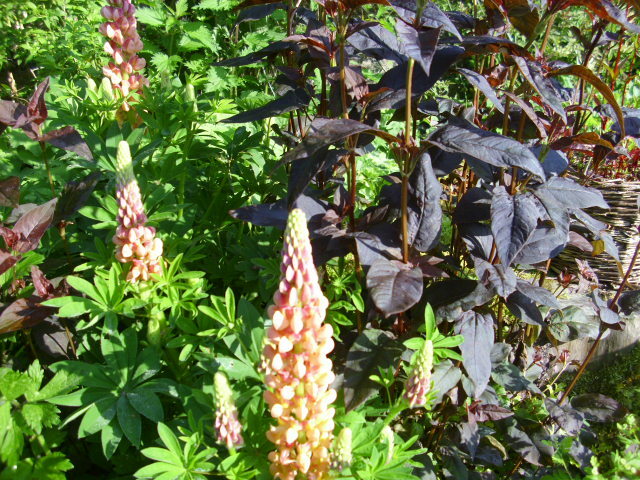 I don’t like this dark leaved Lysmachia, actually I thought I’d removed all of it, but I have to admit it makes a good pairing with this peachy pink Lupin. Maybe it’s saved itself! 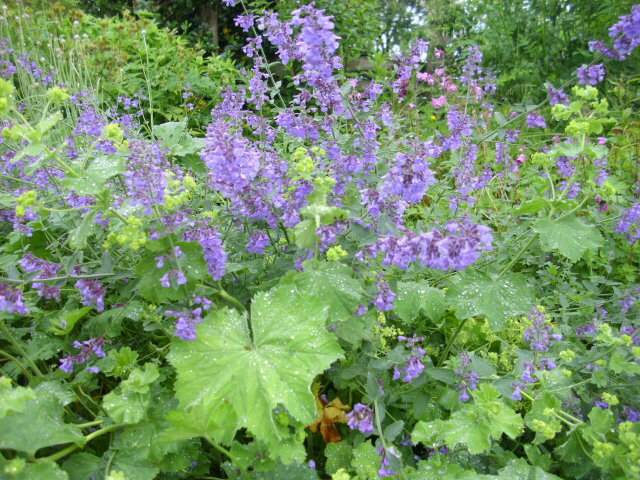 Lady’s Mantle and Catmint, two plants I really like, they look good together. I have to admit I’m a trial and error gardener. I bung everything in, cottage garden style, if it really does’nt work I’ll just move plants in the dormant season. I know some people swear by plans and charts but not for me. 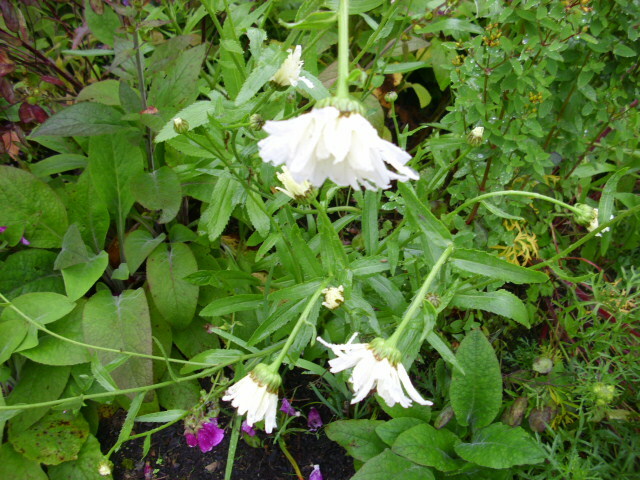 Lots of self seeders are left to prosper too. I don’t have the heart to remove them. 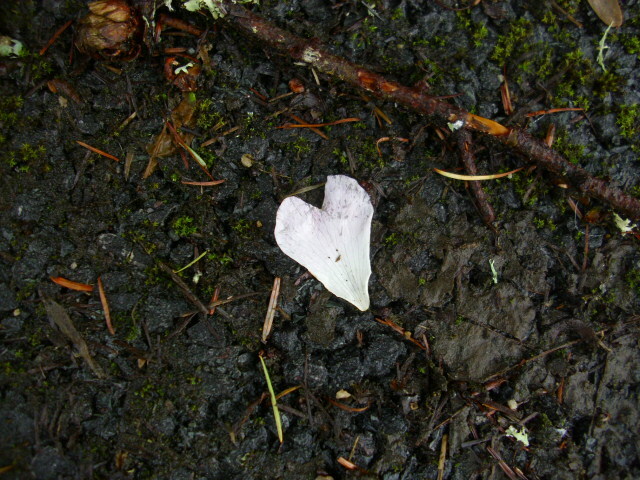 each fallen petal leaving a temporary love message for all to see.